Birmingham Academy is linked with Brixton Academy and Shepherds Bush Empire. It is the biggest and one of the best venues for musical shows in the city. The Academy is well known for its nightlife. Birmingham Academy has five bars in the main venue, two of which are situated on street level, one in BA2 and the other on the balcony over looking the main dance floor. Rest 3 bars are downstairs and the Island bar, among them is the largest. The two others are at the back of the dance floor. You can also find a bar academy on the next door with a more intimate setting. McKenzie Group opened the Birmingham Academy in November 2000. With the success of Brixton Academy, McKenzie opened its second academy branded with live music and clubs. Birmingham's need for a medium sized venue was fulfilled with the opening of this academy. Carling Academy, Birmingham is the premier venue in the city offering the best live events and club nights for the residents of Midlands. Meanwhile, the academy is the perfect gig on the UK touring circuit, with music of all genres and artists from across the globe, which includes Beck, Primal Scream, The Strokes, Dido, Basement Jaxx, The Hives and Iron Maiden. Carling Academy, Birmingham is home to popular nightclubs. The famous Ramshackle is on every Friday. It is one of the largest clubs in the country catering to high end music ranging from break beats and hip hop to funky classics and drum and bass to indie and northern soul. The academy with its recently developed BA2 provides constant support for upcoming acts and local talents. 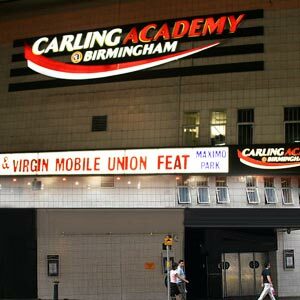 The Bar Academy, situated next door to Carling Academy, Birmingham is the perfect place for intimate shows and gigs by local bands, rising stars and live PAs.